Works of the late Myron Barnstone, a master painter before becoming an internationally respected fine arts teacher for 35 years, are revealed for the first time in New York. The thousands of Barnstone Studios alumni, many of whom went on to distinguished careers in art-related fields, had never even seen their mentor's own work. New York, NY, March 20, 2019 --(PR.com)-- Paintings unveiled at Usagi Gallery in Brooklyn, April 12 -17 have been locked away from the world for nearly half of a century. “A Celebration of Joy: Myron Barnstone’s Hidden Art” journeys inside the work of a man who surrendered a promising career as a painter to teach the next generation of artists. During the reception 6 - 10 p.m. April 12, Barnstone’s daughter Catherine "Cat" Szafran will uncrate a painting never before seen by the public. In 1967, the late Myron Barnstone was the toast of Paris. His “the survivors” exhibit, with haunting anti-war paintings, was lauded by media internationally. Before his early success, Barnstone studied at the Ruskin School of Art in Oxford, England, and became friends with fellow student R.J. Kitaj. Barnstone’s work has been compared to “School of London” artists such as Kitaj, Francis Bacon and Lucien Freud. Barnstone evolved as a virtuoso draftsman and master anatomist with his forceful and vibrant expressionist style. While his career was on the rise, Barnstone felt contemporary art school instruction was on the decline. He was so frustrated teachers encouraged students to do “what felt good” instead of giving them a strong foundation that Barnstone decided to stop painting, and teach. He burned hundreds of his own pieces, and locked away the rest to keep from influencing his students’ style. For the next 35 years, thousands studied at Barnstone Studios in Coplay, Pennsylvania, and learned the geometric discipline of design taught in classical ateliers of the Renaissance. Many alumni have distinguished themselves in art-related careers. One even traced Barnstone’s art lineage directly back to Leonardo da Vinci and Michelangelo. It wasn’t until after Barnstone’s death in 2016 at 83, Szafran took over Barnstone Studios and opened the crates her father sealed half a century earlier. The Usagi exhibit is the first NY show of Barnstone’s work and includes an interactive element ushering guests into the duel worlds of Myron Barnstone, Master Painter and Myron Barnstone, Master Teacher. Gallery hours are 8 a.m. - 6 p.m. Monday through Friday; 11 a.m. - 5 p.m. Saturday and Sunday. 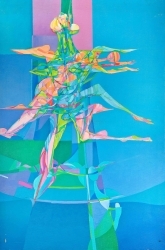 “Celebration of Joy: Myron Barnstone’s Hidden Art” will run through April 17. Usagi is located at 163 Plymouth St., Brooklyn, NY, 11201.